CBI - China: Day 137 of 154 of the Japanese Invasion of Manchuria. CBI - China: Day 7 of 10 of the Battle of Harbin, Manchuria. CBI - China: Day 5 of 41 of the 1st Battle of Shanghai. Germany: Two days after Hitler is appointed Chancellor, Lutheran Pastor Dietrich Bonhoeffer, while giving a radio address The Younger Generation's Altered View of the Concept of Fuhrer, is cut off just into his address when his microphone is switched off. CBI - China: Day 32 of 142 of the 1st Battle of Hebei. Spain: Day 200 of 985 of the Spanish Civil War. Spain: Day 565 of 985 of the Spanish Civil War. CBI - China: Day 210 of 2,987 of the 2nd Sino-Japanese War. Spain: Day 930 of 985 of the Spanish Civil War. CBI - China: Day 575 of 2,987 of the 2nd Sino-Japanese War. ETO - UK: The Home Guard spots German spy Josef Jakobs as he parachutes into England, easily apprehending him near Dovehouse Farm, Ramsey Hollow. Jakobs will be executed by firing squad in the Tower of London on 15 Aug 41. Finland: Day 64 of 105 of the Russo-Finnish War. In southern Finland, the Soviets launch a big offensive across the iced up straits of Viipuri Bay, but were beaten back by the Finnish Air Force. CBI - China: Day 940 of 2,987 of the 2nd Sino-Japanese War. Day 79 of 381 of the Battle of South Guangxi. Day 5 of 67 of the Battle of Wuyuan. USA: The US Navy is reorganized in to the Atlantic, Pacific and Asiatic fleets and ordered to gradually bring ship crews up to war establishment. Atlantic: The German heavy cruiser ADMIRAL HIPPER slips out of Brest, France, for another sortie into the Atlantic. ETO - UK: Day 149 of 258 of the Blitz. MTO - North Africa: Day 55 of 63 of the UK's Operation COMPASS, their campaign in North Africa against the Italians in Egypt and Libya. East Africa: Day 237 of 537 of Italy's East African campaign in the lands south of Egypt. Agordat in Eritrea falls to the 5th Indian Division after 2 days of fighting. CBI - China: Day 1,306 of 2,987 of the 2nd Sino-Japanese War. Day 3 of 31 of the Battle of South Henan. CBI - Thailand: Day 124 of 221 of the Franco-Thai War (Vichy France vs Thailand). Atlantic: Day 19 of 169 of Germany's Second "Happy Time," during which U-boats sink 609 Allied ships with little risk. All U-boats adopt a new Enigma cipher known as Triton, which the British will not be able to break until much later in the year. ETO - Norway: Vidkun Quisling forms a puppet government under German rule. Russian Front - North: Day 147 of 872 of the Siege of Leningrad. Russian Front - North: Day 24 of 29 of the Battle of Toropets, Russia. A failed attempt to break the siege at Leningrad. Russian Front - North: Day 10 of 103 of the Battle of the Kholm Pocket. Another attempt to break the siege at Leningrad. Russian Front - Center: Day 25 of 103 of the Battle of Vyazma, Russia. Russian Front - Center: Day 25 of 103 of the Battle of Sychevsk, Russia. Russian Front - South: Day 95 of 248 of the Siege of Sevastopol, Crimean Peninsula. All German attacks against Sevastopol are stopped for the winter. CBI - Burma: Day 50 of 164 of Japan's Invasion of Burma. CBI - China: Day 1,671 of 2,987 of the 2nd Sino-Japanese War. Day 40 of 99 of the 3rd Battle of Changsha. CBI - Java: Day 3 of 17 of the Battle of Singapore. The Japanese siege of British troops in Singapore continues. PTO: First US aircraft carrier offensive of the war, as YORKTOWN and ENTERPRISE conduct air raids on Japanese bases in the Gilbert and Marshall Islands. PTO - Borneo: Day 48 of 107 of the Battle of Borneo. PTO - Dutch East Indies: Day 3 of 5 of the Battle of Ambon. PTO - New Guinea: Day 10 of 18 of the Battle of Rabaul, New Britain Island. PTO - Philippines: Day 56 of 152 of the 1st Battle of the Philippines. 5th Air Force provides air support. USA: Ground is broken at Oak Ridge, Tennessee, for the first Uranium-235 processing plant. 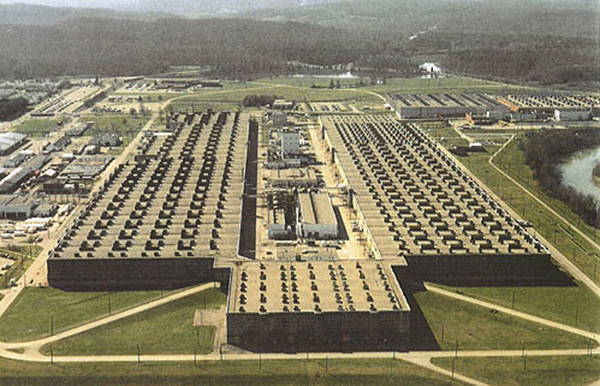 Oak Ridge, about 25 miles west of Knoxville, Tennessee, was chosen as the site for developing materials for the Manhattan Project in 1942 for several reasons. Its relatively low population made acquisition affordable, yet the area was accessible by both highway and rail, and utilities such as water and electricity were readily available due to the recent completion of the Norris Dam. Finally, the project location was established within a 17-mile long valley, and the valley itself was linear and partitioned by several ridges, providing natural protection against disasters between the four major industrial plants so they wouldn't blow up "like firecrackers on a string." The location and low population also helped keep the town a secret, though the population of the settlement grew from about 3,000 in 1942 to about 75,000 in 1945. The uranium-separating facility by itself covered 44 acres and was the largest building in the world at that time. The name "Oak Ridge" was chosen for the settlement in 1943 from among suggestions submitted by project employees, in part because of the settlement's location along Black Oak Ridge, and in part because the rural-sounding name "held outside curiosity to a minimum." The name wasn't formally adopted until 1949, however, and was only referred to as the Clinton Engineer Works (CEW). All workers wore badges, and the town was surrounded by guard towers and a fence with seven gates. Russian Front - North: Day 512 of 872 of the Siege of Leningrad. German troops evacuate Demyansk in northwestern Russia. Russian Front - North: Day 273 of 658 of the Siege of the Kholm Pocket, USSR lays siege to the Kholm Pocket but the Germans hold out for a about a year and a half. Russian Front - South: Day 164 of 165 of the Battle of Stalingrad, bloodiest battle in human history. Russian Front - South: Day 52 of 69 of the USSR's Operation LITTLE SATURN. A successful drive into the Northern Caucasus and the Donets Basin pushing the Axis troops out. MTO - Tunisia: Day 77 of 178 of the Battle of Tunisia. RAF and US Air Forces provide Allied air support. CBI - Burma: Day 43 of 104 of the 1st Battle of Arakan. US 10th Air Force provides air support bombing the Arakan tea sheds on the Rangoon River near Rangoon harbor. CBI - China: Day 2,036 of 2,987 of the 2nd Sino-Japanese War. PTO - Alaska: Day 240 of 435 of the Battle of Kiska, Aleutian Islands. Japanese aircraft bomb and strafe Amchitka harbor and shipping without inflicting damage. PTO - Malaya: Day 348 of 357 of the Battle of Timor Island, a long guerrilla war ending in Japanese victory. Allies begin evacuating off the island. PTO - Solomon Islands: Day 179 of 187 of the Battle of Guadalcanal. US 13th Air Force provides air support. Twenty Japanese destroyers begin evacuating 13,000 troops. Poland: The Polish underground executes Major Fritz Kurschera, the Gestapo chief in Poland. Russian Front - North: Day 638 of 658 of the Siege of the Kholm Pocket. USSR lays siege to the Kholm Pocket but the Germans hold out for a about a year and a half. Russian Front - North: Day 19 of 48 of the Battle toward the Narva River, Estonia. This drive helped lift the Leningrad siege and goes on to liberate Narva. Russian Front - North: Day 19 of 33 of the Battle of Luga, Russia. Taking this town west of Leningrad will open the door toward Estonia. Russian Front - South: Day 40 of 113 of the USSR's Dnieper-Carpathian Offensive in southwestern Ukraine. Russian Front - South: Day 3 of 31 of the Battle of Nikopol, Ukraine. Russian Front - South: Day 9 of 25 of the Battle of the Korsun Bulge in Ukraine. Russian Front - South: Day 6 of 16 of the Battles of Rovno and Lutsk, Ukraine. This Soviet victory will increase the gap in the German line from 70 to 110 miles wide. MTO - Italy: Day 16 of 123 of the Battle of Monte Cassino. German troops make a strong stand at the Gustav Line against the Allies. RAF and US Air Forces provides air support for the Allied ground troops. MTO - Italy: Day 11 of 136 of the Battle of Anzio. RAF and US Air Forces provides air support for the Allied ground troops. CBI - Burma: Day 34 of 99 of the 2nd Battle of Arakan. CBI - Burma: US 10th Air Force B-24s bomb the airfields at Mingaladon and Nyaungbinwun. CBI - China: Day 2,401 of 2,987 of the 2nd Sino-Japanese War. PTO - Marshall Islands: Day 2 of 8 of the Battle of Kwajalein. US 7th Air Force provides air support. PTO - New Guinea: Day 136 of 219 of the Battle of Shaggy Ridge. 5th Air Force provides air support. PTO - New Guinea: Day 133 of 162 of the Battle of the Huon Peninsula. 5th Air Force provides air support. PTO - New Guinea: Day 49 of 597 of the Battle of New Britain. US 13th Air Force provides air support. PTO - Solomon Islands: Day 93 of 295 of the Battle of the Bougainville Islands. US 13th Air Force provides air support. ETO - France: Day 185 of 284 of the Battle of Brittany. ETO - France: Day 140 of 236 of the Siege of Dunkirk. ETO - Germany: Day 136 of 145 of the Battle of Hürtgen Forest. US 1st Army takes Remscheid, 20 miles to the east of Düsseldorf. ETO: Day 13 of 66 of the Battle to the Rhine. US 9th Air Force provides air support. ETO - Germany: US 8th Air Force B-17s hit rail targets and bridges in western Germany. Russian Front - Finland: Day 140 of 223 of the Lapland War. Finland and Russia have joined forces to kick the Germans out of Finland's most northern province. Russian Front - Center: Day 110 of 206 of the Battle of the Courland Pocket in Latvia. Russian Front - Center: Day 8 of 75 of the Battle of Königsberg, East Prussia (now Kaliningrad, Russia). Russian Front - Center: Day 6 of 17 of the Battle of Rastenburg, East Prussia. Russian Front - Center: Day 7 of 63 of the Battle of the Heiligenbeil Pocket in East Prussia. Russian Front - Center: Day 21 of 23 of the Battle along the Vistula and Oder Rivers in central Poland and eastern Germany. Soviets surround the fortress town of Küstrin. This small town is on both sides of the Oder River, half in Germany and half in Poland. Russian Front - Center: Day 1 of 31 of the Battle of Schwedt, Germany. Russian Front - Center: Day 19 of 21 of the Battle of Warsaw, Poland. Russian Front - South: Day 96 of 108 of the Battle of Budapest, Hungary. Soviet troops have encircled Budapest and lay siege. MTO - Austria: US 15th Air Force B-24s and B-17s bomb at Moosbierbaum, Graz, Furstenfeld and Klagenfurt. CBI - Burma: Day 14 of 61 of the Battles of Meiktila and Mandalay. The US 10th Air Force provides air support. CBI - Burma: Day 12 of 39 of the Battle of Ramree Island. The US 10th Air Force provides air support. CBI - China: Day 2,767 of 2,987 of the 2nd Sino-Japanese War. CBI - Indochina: US 14th Air Force attacks shipping off the coast of French Indochina. PTO - Japan: US 7th Air Force bombs the two airfields on Iwo Jima during the day and night. PTO - New Guinea: Day 402 of 597 of the Battle of New Britain. PTO - New Guinea: Day 286 of 481 of the Battle of Western New Guinea. PTO - Philippines: Day 105 of 299 of the 2nd Battle of the Philippines, aka the Liberation of the Philippines or the Philippines Campaign. PTO - Philippines: Day 49 of 244 of the Battle of Luzon. US troops land unopposed to the southwest of Manila. 5th Air Force provides air support. 5th Air Force provides air support. PTO - Philippines: Day 2 of 22 of the Battle of the Bataan Peninsula. 5th Air Force provides air support. UK: The Auxiliary Territorial Service (ATS), a women's branch of the British Army, is merged into the Women's Royal Army Corps.